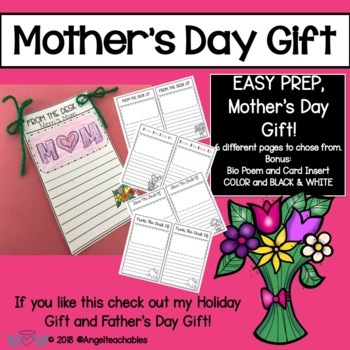 This adorable personalized notepad, is sure to be a hit with your students, and their moms. It's the perfect Mother's Day Gift. *A special "mom" where students write all about what makes their mom special. This can be inserted into a card. Thank you for purchasing from my store! If you like this product check out my Father's Day and Holiday Gifts as well. Remember to rate the product so that you earn TPT credits towards buying your next purchase! For more information on NEW products, SALES and FREEBIES be sure to follow me!